Every year I write a blog post with the outcome of the COL survey and I am always trying to think of a new way to deliver these results. For this year I decided to focus on something near and dear to all of you… the “Law” (or rather the law behind “why” we do the survey). An allowance can also be included for “books, supplies, transportation and miscellaneous personal expenses”. And again it’s vaguely quantified as a “reasonable amount” as determined by the school. The challenge of the Act is that it then dictates that “students must be awarded on the basis of a Cost of Attendance comprised of allowable costs assessed all students carrying the same academic workload. “. You need to use a common Cost of Attendance for every student in the same degree program in determining aid. In other words, there cannot be individual budgets based on each student’s actual costs incurred or on lifestyle choices students may make. So the annual survey is born out of our need to judiciously establish that level of “appropriate and reasonable” for room and board, transportation and book expenses and then calculate “average costs” that we feel can be applied to all students. First off, we had an excellent response rate of almost 40% of all JDs and Graduate students. So the data collected is from a good representative sampling of students. Thank you to all who took the time to complete the survey. As in past years, the vast majority of students choose to live in New Haven (97%) with 61% indicating they chose to live in “downtown” New Haven followed by 26% in East Rock. We saw an uptick in the number of students living alone versus living with a roommate. And that trend increased in all JD classes (1Ls-3Ls). It’s what drove us to actually do a short supplemental survey targeted to anyone who was living alone to understand this choice better. The most wide spread answers as to “why” people were living alone were : the need for personal space to study/work, the inconvenience/ challenge of sharing space and a desire for independence/freedom. All valid personal reasons for making this choice- but a recognized “choice” (not necessity) none the less. Should additional financial aid be allocated to support that personal choice? That’s a tough judgment to make given that by law the budget must be “reasonable” and apply across the board to all students in the same degree program. But what concerns me most is the long term cost of that choice. 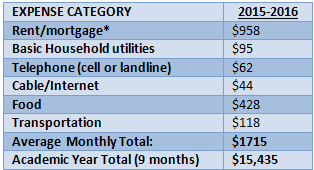 Based on the average inclusive monthly living costs (more detail on that later) here is the comparison between all the living arrangements. 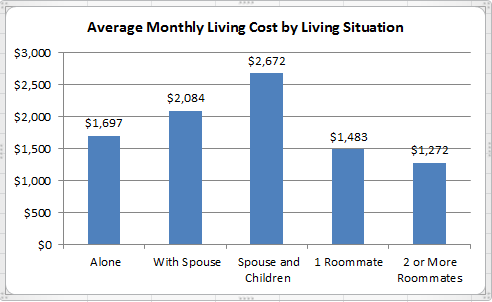 So let’s look at it this way… monthly difference between living alone ($1,697) vs. living with two or more roommates ($1,272) is $425/month. For the nine month academic year that’s $3,825 or for a three year JD degree it’s $11,475. If you’re paying for that higher cost by borrowing Grad Plus loans then you’ve got interest building on that $11,475 so that by the time it goes into repayment it’s now… $15,000. If you go on a 10 year repayment plan then ultimately (with interest) you are paying off a balance of $20,899 or (worse) on a 25 year plan $31,805. That’s what choosing to live alone is actually costing you- and it’s a pretty high price for solitude. That $15,435 is a 5% increase over last year’s average of $14,679. But it’s still well below the $17,000 that we have been budgeting for living expenses. 40% of you continue to purchase food “out” or from the YLS Dining Hall. I know for the sake of convenience and your busy schedules that’s the easiest options but cannot stress enough how making a couple of meal per week at home or brown bagging your lunch each day can save you considerable dollars. Average annual cost for books was $782- so the $1,100 we budget should support that. 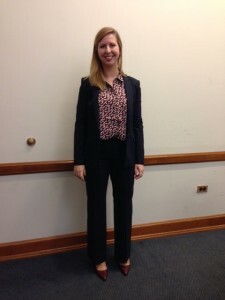 Average cost of professional clothes increased by 3% to $673 per year. So our $500 allotment for the COAP eligible suit loan falls a little short there and will be examined. 54% of you indicated you “keep a budget”. I love hearing that but wish we could have seen a significant bump up in that number this year. Again if you have any questions on setting up a budget, need a good Excel template to follow, want to know what aps are good to use etc., come by our office. 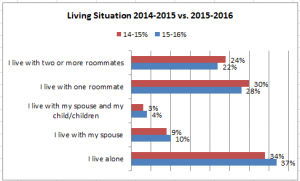 Several surveys cited that the YLS living allocation was less than other Yale Graduate Schools. In actuality, YLS has historically been and continues to be the second highest allocation behind SOM. When we asked you to identify any other “ongoing expenses” several people cited support they provide parents or other family members. And while I empathize with your obligation to help and care for your family, financial aid and the student budget are, again by law, meant to support the student only. But if you have a challenging family situation I absolutely encourage you to come discuss it with me so that we can see what other options (within regulations) might help you. Also in the “ongoing expenses” many of you cited the costs of keeping your pets (specifically a significant number of cat owners). I completely get this one having spent a near fortune on my three cats on veterinary bills, cat food and, of course, enabling their catnip “habit”. As an animal lover, if it were up to me, I would classify them as “dependents” but again based on those federal regulations- no such luck for a student budget. So what does it all mean for you? For the 2016-2017 academic year we are going to maintain a book allowance of $1,100 and a general living allowance of $17,000 (particularly since based on the average monthly cost that would still grant a $1,565 buffer between the $15,435 average per year vs. the $17,000 presently allocated). That buffer is there to support incidentals, household expenses, higher cost travel and emergencies that many of you cited in the survey as “additional costs”. We want our financial aid calculations to be a transparent and public process. So if you have additional questions on the Cost of Living survey, its use or how aid awards are made, please reach out to our office and we would be happy to explain or run a mock aid award for next year for you. Also if you are challenged to stretch your funds to meet costs or are seeking ways to maintain a budget, we are always here to offer advise and resources in that regard also. In a prior blog post I formally laid to rest the federal Perkins Loan when it seemed after years of life support, Congress finally pulled the plug on this loan program. But wait… in a “zombie- esque “ moment the Perkins Loan seems to have risen from the grave (though not completely in its former iteration). On December 18th, President Obama signed into law the Perkins Loan Program Extension Act of 2015 extending the authorization of the Perkins Loan Program for another two years . However (as with all zombies) the Program will not 100% look like it did before. Going forward “new “ Graduate students will not be eligible for Perkins Loan support (so only prior recipients of Perkins Loans will have the ability to receive additional support). This is slightly problematic for YLS given that we have always allotted Perkins Loans to our 1Ls exclusively so that they could take advantage of the “subsidized” (no interest building) aspect of the Perkins loan over their full three years of enrollment. So, depending on what allotment of Perkins Loan funds we receive from central Yale Student Financial Services, it looks like it’s the 2Ls (Class of 2018) who will have eligibility for and will benefit from continued Perkins support. But in an even more shocking “zombie” move… another long dead loan program benefitting Graduate Student is also trying to rise from grave- the Direct Subsidized Stafford Loan. This loan program was killed in 2011 by the Budget Control Act of 2011, ostensibly to reduce the federal budget deficit, and it was a significant blow to Graduate students who had been able to borrow up to $8,500 (with no interest building all through enrollment and the post-graduation six month grace period) through this loan. But, just when you thought the Direct Subsidized Stafford was only a distant memory, last month Rep. Judy Chu (D-CA) introduced the Protecting Our Students by Terminating Graduate Rates that Add to Debt (POST GRAD) Act which would restore eligibility for Graduate students to receive a subsidized Stafford loan. Unfortunately, because the bill would not be budget neutral, it’s very unlikely that Congress will take action on it in this current session. It is however a tremendously positive sign that the need for a subsidized loan vehicle for Graduate students is even being discussed or on Congress’ radar. Why is subsidized interest so important? Look at it this way… if you borrowed that $8,500 in your 1L year in a Direct Unsubsidized Loan at the current 5.84% interest – you would accrue an additional $1,591 in interest by the time the loan goes into repayment. Then it gets worse… when the loan does go into repayment that in school interest gets “capitalized”(or added ) into the total loan principal… so now you are paying interest on that interest. Ultimately on a 10 year repayment that $1,591 of interest now costs you $2,119 (and at a 25 year repayment its $3,075). Bottom line… getting any type of subsidized loan vehicle (Perkins or Stafford) for Graduate students at any amount is a” win” in loan repayment. So after my last blog post sharing online calculators that can assist you in every permutation of loan repayment, I realized I forgot to showcase the MOST important online calculator of all… our new COAP Calculator. It was a long time in the making and I want to especially thank Syed Alli from the YLS IT Department for not only developing the online capacity for the calculator, but also for taking the time to understand the overall complexities and inner workings of the COAP program itself. You will notice that on the last screen of the calculator there is a large “disclaimer” (seriously, I hang around with enough lawyers to know I need a disclaimer) basically reinforcing – that the online calculator is meant to only provide a possible estimate of COAP funding support and should not be construed as a promise or commitment of future COAP support. And, of course, actual COAP awards are only made based on a full review of a submitted COAP application. Step 1- Annual Income– begin by entering your projected COAP income. Notice there is a pencil icon next to this field which when opened drives you to the Annual Income Calculator where you can enter your income, spouse income, income exclusions for children and assets and then populates the Annual Income field for you. Step 2– Income Growth Rate– you choose the percentage by which you want your income to increase per year. The system defaults to 5%. Step 3– Loan Amount– enter your total amount of either actual or anticipated loan debt. To find your current loan debt – go to www.nslds.ed.gov. Step 4- Interest Rate– enter an estimated or actual weighted average interest rate. Want to calculate a weighted average for your combined loans- visit the finaid.org consolidation calculator. Screen 2– a chart with your individual loan repayment plan showing the annual COAP payout and then your portion of that payout versus the YLS institutional contribution. The COAP calculator is a good starting point in understanding how COAP can support your loan repayment. Note that the calculator is specific to COAP guidelines and policies for anyone admitted after September 1, 2011. For a more specific projection (one that might factor changes in employment, marriage and children as they happen throughout your ten years of COAP eligibility) I would encourage you to set up an appointment with our office so that we can “delve into the weeds” of your own repayment and COAP options. The online calculator was a tool that was high in demand from both new admit students seeking to compare LRAP programs (of which we know COAP is the best!) , as well as 3Ls on the brink of actual loan repayment. So we are extremely happy to see it actualized. Use it well! There is no better example of “if at first you don’t succeed try, try again” then our federal loan repayment program. Because by the end of this year there will be (wait for it…) yet another loan repayment option available to borrowers. If you’re keeping count (and really who can at this point) that makes nine options. Seriously that’s enough repayment plans to field a baseball team. So who is this new player in loan repayment? It’s REPAYE, which we are told is not an acronym for “repayment” but for “revised Pay As You Earn (PAYE)” – one of the other plans. So REPAYE is a lot like PAYE with a few notable exceptions that Graduate students, in particular, will not be happy about. REPAYE is another one of the “income driven repayment plans” meaning that like PAYE and IBR (Income Based Repayment) your actual loan payments are calculated based on a percentage of what is determined to be your discretionary income. And like PAYE again, for REPAYE that percentage is 10% of income. With both IBR and PAYE- there was a partial financial hardship qualifier for eligibility. Anyone at any income (hardship or not) can choose REPAYE. But with that loss of financial hardship provision a cap on the maximum you would ever have to pay per month was also lifted. With IBR and PAYE, that max you would pay was equivalent to what you would have paid if you were on the standard (10 year) plan. With REPAYE that cap no longer exists. Meaning if you are on the plan and have a significant income spike you could be paying more than on any other repayment option. With any of the income driven plans there is the likelihood that your payments (based on income) could be calculated so low that you are not even covering the interest that is building on the loan (also called negative amortization). However at the end of 20 years with PAYE or 25 with IBR, the Department of Education as lender would forgive the balance of the loan and all that accumulated interest. With REPAYE, by virtue of having loans at the Graduate level you are automatically pushed to a 25 year repayment schedule (no 20 year option). Why is that significant? Well in addition to making 5 more years of payments on your loans, you also have five more years of the potential negative interest building. So why is that an issue if the Department of Ed is going to forgive the full balance any way in year 25? Because right now the way that the current tax law is written that forgiveness in year 25 is a taxable occurrence….meaning that you have to declare the entire amount of the forgiven loan balance as “income” on your taxes? Income that technically you never saw… “phantom income”. And the result could be a pretty significant tax liability at a point in your life (25 years from now) when you may have a lot of other financial priorities (mortgage, car payment, kids in college). So by pushing Graduate students to a mandatory 25 year repayment on REPAYE- you, the borrower, pays more in loan payments and you will most likely also pay more in taxes. There are some other hidden nuances in REPAYE as well that change the loan repayment landscape. One is the “closing” of the marriage loop hold. In IBR and PAYE if you are married and file your taxes separately (not jointly), then only your income would be used to calculate the income driven repayment amount. However in REPAYE that provision is gone and now regardless of whether you file taxes as married jointly or married separately both you and your spouse’s income would be used to calculate your monthly loan repayment? 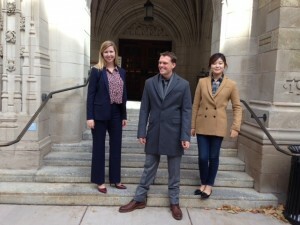 Move Over NYC… it’s Fashion (On a Budget) Week at YLS! 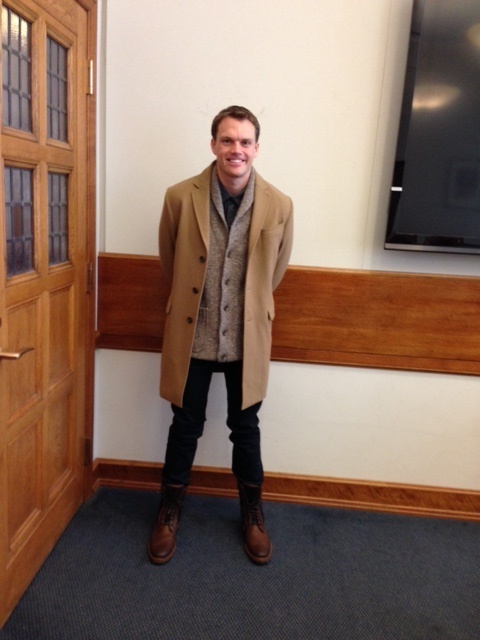 Think you need to go to the pages of Elle, Marie Claire or Esquire to see the latest fashion trends? Au contraire! You could see it right here at YLS in our “Dress For Success… For Less. Part 2” workshop held on November 2nd. Given the popularity of this workshop last year , we had to bring back fashion stylist Shanelle Rein-Olowokere to guide us through the ins and outs of how to look good without breaking the bank. Shanelle is simply loaded with practical and cost efficient tips on how to maximize your fashion budget. Most importantly, she also understands what work in a conservative (i.e. looks law firm ) environment vs a less format (aka public service) work culture and she encouraged audience members to take time to study and understand the appropriate dress code for their workplace. For that conservative work setting, Shanelle recommends that the essentials you should have in your closet include 2-3 suits, 8-10 shirts or blouses, 2-3 pairs of nice trousers, 2-3 blazers, 2-3 loafers/oxford shoes for women or heels for women and 2-3 nice knits including cardigans and pullovers in a solid colors. For a more casual work environment, Shanelle recommends that the basics include at least one suit (in navy or black), 8-10 shirts or blouses, 4-5 pairs of nice trousers or skirts, 2 pairs of tailored jeans (dark wash), 2-3 blazer and an equivalent 3-4 nice knits. —-Don’t start shopping until you have a defined list of what you need. That list will keep you from buying random items and impulse buys and will also track what was bought and what you still need. — Go online and see what stores are offering there first. It’s a more productive way to browse than the hassle of going to an actual store. And when you actually go to into the store , it will make more efficient use of your time when you can go in and try on exactly what you want quickly. — Shop smart and above all wait until something goes on sale or when a store is offering some sort of promotion. Never pay full price. And once you have enough pieces for a set “starter” wardrobe you can then start shopping off season for even greater savings. 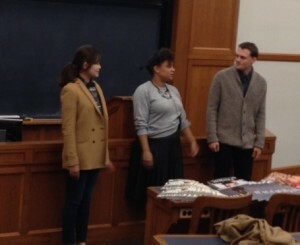 And what would Fashion Week at YLS be without actual models on the runway? 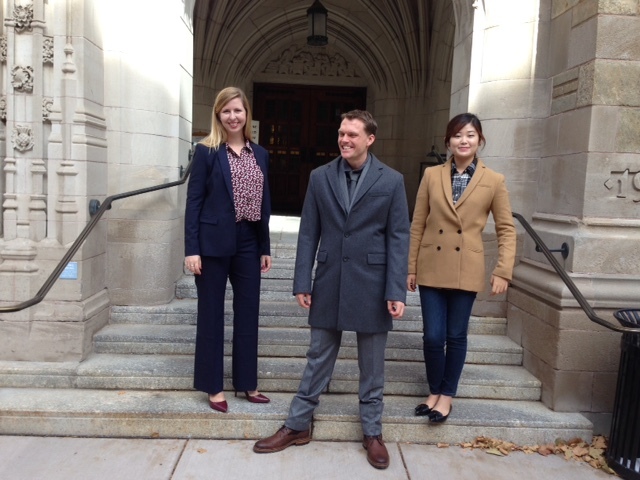 YLS’sown Jacqueline Van DeVelde ’17, Paul Rink’ 18 and Hyun-Soo Lim’ 18 volunteered to show off some of the newest fashion trends from Banana Republic . Shanelle specifically chose the model’s “looks” to demonstrate examples for varied workplace settings. First, Paul and Hyun-Soo modeled pieces appropriate to a casual work setting based on pairing jeans, knits and camel jackets. Then Paul (doing double duty) and Jacqueline each modeled stylish suits appropriate to a conservative work setting. The session ended with a great Q&A where Shanelle fielded questions on everything from where to find a good tailor (answer test one with a small job first) to what to wear if you work in an office in the South (don’t worry it will be air conditioned- bring a cardigan!) to whether high heels are” required” in a conservative workplace (dressy flat shoes are perfectly appropriate and comfortable!). The more “conservative” workplace look! Above all throughout the workshop, Shanelle reinforced the important statement your work clothes can make in letting your employer know that you take yourself and your work seriously. And the reality that you can achieve that look in a very cost effective way. Until next year’s Fashion Week- see you all on the runway! At midnight, on Wednesday, September 30th the Perkins Loan, age 57, died unexpected on the floor of the U.S. Senate. Born in 1958, Perkins had a six decade life of assisting high need students with its subsidized low interest rate of 5%, extended 9 month grace period and flexible repayment terms. Perkins is survived by its siblings the Direct Unsubsidized and Grad Plus loans. In lieu of flowers, condolences should be offered to any of the 500,000 present recipients of the loan, as well as to future generations of student loan borrowers. An obituary for the now deceased Perkins loan seems absolutely appropriate. Perkins loans were unique in that loan funds were actually awarded and managed by the educational institution themselves and, as such, could target and benefit specific students of high need identified by that institution. In the case of YLS, our Perkins funds were directed to 1L students with the highest institutional scholarship need. We allocated these loan funds for the first year of enrollment, so that the interest subsidy would benefit students over their full three year enrollment. So what happened that caused the demise of the Perkins loan program? The Perkins Loan program had been close to death for a while since it was originally slated to sunset in 2014 and was on life support since then through annual renewals. But last month, in one of its 11th hour moments, the House passed the Higher Education Act of 2015- a bill that would have extended the Perkins Loan Program for an additional year. Then on September 30th a bipartisan (yes I said bipartisan!!) group of Senate members took to the floor to discuss adopting the House passed bill. But (in a “no one saw this coming” moment) Senator Lamar Alexander (R-TN) chairman of the Senate Health, Education, Labor and Pensions (HELP) Committee objected under a “unanimous consent” procedure which requires unanimity to advance issues forward. And with that objection, the Perkins Program was left to expire at midnight. Senator Alexander’s rationale in letting the Perkins loan program end was based on his contention that extending the program would simple perpetuate an overly complex federal student aid system. Senator Alexander has been advocating for his bipartisan “Financial Aid Simplification and Transparency Act (FAST) which calls for a streamlined federal aid program of one grant and one loan for all eligible students (undergraduate or Graduate level). If in your 1L year you had a $6,000 Perkins but now have to borrow and additional $6,000 in Grad PLUS loan (at the present Grad PLUS interest rate of 6.84%)- you would have accumulated $1,124 in interest on that Grad PLUS borrowing during your enrollment and subsequent 6 month grace period. That’s interest that if unpaid (during enrollment or grace) will then capitalize into your loan principal when you go into repayment (and then you’re paying interest on interest). So on a 25 year schedule, that $1,124 in interest just amounted to an additional $2,341 in repayment. Let’s also add that the Perkins loan had no origination fee.. so of that $6,000 you borrowed in Grad PLUS- you really only receive $5,744 to use after the 4.272% fee of $256 is taken out. (Yet you pay back the full amount of the $6,000 loan in repayment). Could the Perkins Loan suddenly pull a Walking Dead zombie moment and come back to life? There is the possibility that the program could be reconsidered as part of the reauthorization of the Higher Education Act )HEA) but having the program formally expire has made the option less likely. “If you cook for yourself, rather than buy lunch, you will easily save $5 a day. And it’s easy if you just make a big one-pot meal on Sunday evening”. “Invest in a thermos and make your coffee at home and bring it with you- I estimate that I save $20-$30/week doing this”. “Host/attend potlucks and have friends over for dinner on the weekends. It will motivate you to learn how to cook meals and allow you to eat a variety of dishes for your meals with less effort. It’s also a great way to meet 1Ls outside of your small group :)”.